This fabric swatch gives you a true impression on how great our PROstretch fabric feels, how breathable and light weight it is and on how the 25 PROstretch colours look "in real". in all the 25 available colours for your endless custom team apparel combinations. The price of 10 Euro needs to be charged only to receive back the colour swatch ;-). It will immediately be credited as soon as the colour swatch arrived back at our office. 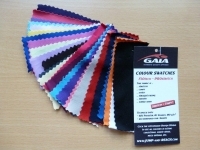 Postage from JUMP+REACH / GAIA Europe to you is already included in the price of the fabric swatch. This Product was added to our catalogue on Tuesday, 29. May 2012.